Ever since attending the cupcake class at Hey Little Cupcake just over a week ago, I've been itching to practice the hardest cake we made... the rose. Never one for making things easy for myself, I bought the nozzle and took up the challenge. I made these cakes using a basic vanilla cupcake recipe from the Primrose Bakery cookbook. I found this recipe to be beautifully light and fluffy, and each cake rose well. A perfect base for the main event. To make the frosting, I used the standard method of double the quantity of sugar to butter, and added pink colour paste and a little vanilla extract. I used two different nozzles to achieve the cakes above. For the smooth piped cake in the centre I used a plain nozzle, and for the 'rose' effect cakes I used a Wilson 1b nozzle. The pink pearls are from Just Bake and the iridescent edible glitter is from Hobbycraft. 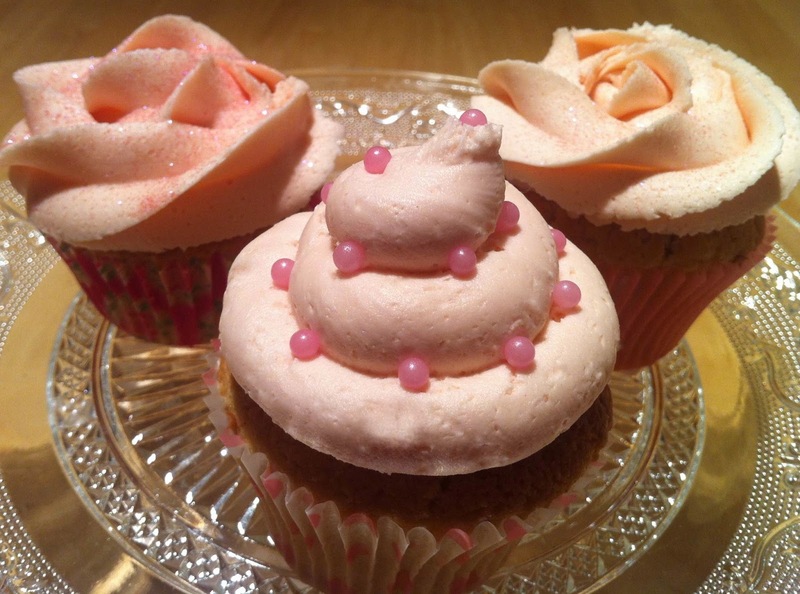 The cupcake cases are a mixture of Dr Oetker and Asda's own.